This important system is composed of two parts, of which one is especially connected with the alimentary canal, whilst the other is widely distributed throughout the body. The former is named the lacteal system, the latter the lymphatic system. Both are composed of vessels presenting a general resemblance to those which convey the blood, and both ultimately discharge their contents into the thoracic duct, a tube which lies beneath the vertebral column and opens directly into the anterior vena cava. Both are interrupted in their course by glands - the lymphatic glands - of which those in relation with the lacteals are chiefly situated in the abdomen at the root of the mesentery, whilst those connected with the lymphatics are found in the axilla, groin, neck, thorax, etc. The purpose of the lacteals, which have their origin in the intestine, is to absorb or take up the constituents of the food, in which they are assisted by the bloodvessels, whilst the lymphatics, which are everywhere distributed through the tissues of the body, reconduct to the larger bloodvessels the plasma of the blood which, having passed through the walls of the smaller bloodvessels, is in excess of the requirement of the tissues, and contains some of the products of their disintegration. As there are some differences between the lacteal and lymphatic vessels it will be expedient to describe them separately, though it must be borne in mind that they are only parts of the same system. The Lacteal System. - It is justifiable in common parlance to say, when an animal has eaten a hearty meal, that it has got its food inside it, but from a physiological point of view the food is still in reality outside the body, and no matter what quantity has been ingested it is unavailable for the nutrition of the tissues, or the production of heat or of nervo-muscular force, until it has been absorbed and assimilated. The starches, oils, and proteids which form the staple of the typical foods such as oats, barley, wheat, and other cereals are, in the raw state, incapable of passing through the walls of the intestine. In order that they may do so it is necessary that they should be rendered soluble, and this duty devolves on the various digestive secretions, that we have seen are poured forth from the numerous glands connected with the alimentary canal. By these juices starches are converted into sugars, oils into very fine emulsions or into soaps, and proteids into peptones, being in each case so modified that they are rendered capable of permeating the intestinal walls and the vessels ramifying upon them, and thus truly entering the body and becoming first assimilated to and then incorporated with it. Fig. 181. - Sketch of the Lymphatic Vessels of the Fore-Leg (inner aspect). The process by which the solutions of sugar, oil, proteids, or salts penetrate the wall of the alimentary tract is termed "osmosis", and can easily be shown by immersing a bladder filled with thick syrup in a jar of pure water, when a double current is immediately established. Some of the sugar solution escapes into the surrounding water, whilst a much larger proportion of pure water passing through the membrane to the syrup enters the bladder, distending it to the utmost and even to bursting. The lacteal system may be said to commence in the delicate velvet pilelike processes or villi which line the whole of the small intestine, and which are shown in the accompanying woodcut (fig. 182, 1). Each villus contains a net-work of minute blood - vessels, not here depicted, surrounding a vessel of larger size (2), which is the lacteal. The latter, commencing near the summit in a blind extremity or a loop, passes down to the base of the villus, where it joins with others to form a net-work. These, after meeting together, emerge from the intestine as vessels of considerable size (2, 2), which accompany the blood-vessels of the mesentery, and, gradually uniting to form larger and larger trunks, terminate beneath the spine in a kind of sac or bladder (receptaculum chyli) which represents the hinder end of the thoracic duct. 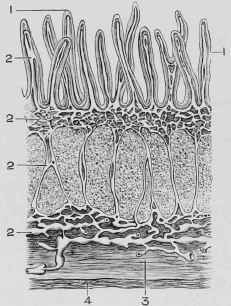 Whilst still contained within the villi, the lacteals are surrounded by muscular fibres, and when these fibres contract, the villi are changed in form from long finger-like processes into short projections, and the fluid they have absorbed, to which the term chyle (Greek chulos, juice) is applied, is consequently driven into the underlying net-work of vessels. The villi thus constitute small force-pumps which, though individually feeble, yet as a result of their numbers become important agents in the onward movement of the lacteal fluid. The vessels forming the net-work are provided with valves in their course which do not allow any backward current, but compel the fluid absorbed to move on towards the receptacle into which it is to be poured. During fasting the lacteals only contain a clear fluid, and were on this account long overlooked. It is only after the consumption of oily foods or of some such fluid as milk that they present the white appearance which has led to the name of lacteals (Latin lac, milk) being applied to them. Fig. 182. - Section through the Small Intestine. 1 Villi. 2 Lacteal Vessels. 3 Muscular Coat. 4 Serous Coat. Although the lacteals are highly important agents in the absorption of the soluble constituents of the food, the part played by the bloodvessels which ramify on the wall of the alimentary canal must not be overlooked. In the lower Vertebrata, as in fishes, no lacteals exist, and therefore all materials absorbed must be taken up through the walls of the blood-vessels in these animals, while it is obvious that the presence of a swift current of a thick fluid like blood on one side of the vascular wall must constitute a favourable condition for the absorption of a thinner and more diffusible fluid from the other side.